Proportional Representation: BC residents to choose a voting system. British Columbia’s provincial NDP government has taken a lead in introducing proportional representation voting system in Canada and do away with the – “Winner takes it all” – First Past the Post (FPTP) electoral system. This is not only good news, it needs to be supported. By now you may have already received the 2018 Referendum on Electoral Reform Voting Package from Elections BC. If you have not yet received it, we advice you do so by contacting Elections BC. What system will we have when we head to the polls next provincial elections posits on the results of this referendum. Therefore, it is imperative that we receive the package, and due to postal strike at Canada Post, return it back to elections BC before 4:30 PM on Friday, November 30, 2018. This is indeed a good thing compare to the current, “Winner takes it all” – FPTP electoral system. Especially, for our Muslim community, where our numbers, just about every constituency in the Lower Mainland are large enough to leverage one party victory over the other. Yet, we have yet to elect a representative to represent us in Victoria, or Ottawa. On election day, it seems as if the Muslim community always ends up being the bridesmaid, but never a bride. Collectively, we have yet to witness an election, federal or provincial, where a major party has given an opportunity to a Muslim candidate to run in a constituency considered “Winnable” by the party. Muslim candidates always end up being appointed to run, what is known in the political world as “Sacrificial Lamb.” Meaning, an opportunity to run in a constituency which the party knows it cannot win. Since, the party needs to run a candidate in each constituency, the Muslim candidate lends himself or herself as the “sacrificial Lamb.” This needs to change. The package contains some simple straightforward questions. First, “Which system should British Columbia use for provincial elections? The current First Past the Post voting system? Or A Proportional representation voting system? The second question however is bit more complex where it presents three forms of proportional representations, requiring us to rank, first, second and third choice from the following systems: Mixed Member Proportional (MMP), and Rural-Urban Proportional (RUP), Dual Member Proportional (DMP). Most of us are pretty much aware, and as mentioned earlier, the current FPTP system is simply a “Winner takes it all” approach, the person with the most votes in each constituency by default becomes our representative in the legislature. So, what is proportional representation. In layman’s term. It means the percentage of the votes party receives corresponds directly to the seats they’ve won. Many view the current FPTP system as broken, and numerous elections in past have proven just that. Most recently, the past federal elections, Trudeau’s Liberals won fifty five percent of the seats and went on to form the government, however, they only won thirty nine percent of the votes. Under proportional representation, the Liberals won thirty nine percent of the votes, hence would have only thirty nine percent of the seats in the parliament. Furthermore, the BC Government has taken it a step further. For instance, MMP, is a hybrid system which combines the Proportional representation as well as FPTP. Under this system the voters vote for their local representative, just like now under FPTP, as well as a party of their choice. For instance, in a given constituency, f the voters supported Party A through riding, amounting to ten percent, and as their second choice also Party A, amounting to twenty percent. This would simply translate into a thirty percent support for the Party A in a given constituency. Thus, the party would be awarded additional MLA’s to top up the difference, resulting in proportional representation. These MLA’s could be appointed by the party – a closed list – or by voters rating their top candidates – an open list. The second system being proposed is RUP, where rural ridings will be represented according to the MMP system, mentioned above, and urban ridings will be determined through a Single Transferable Vote (STV). Under STV multiple candidates are elected form a single riding. Voters will rank candidates according to their preferences. To win a seat a candidate must win a certain percentage of the votes. This eliminates a situation where a candidate is elected for whom the majority did not vote for. If none of the candidates reaches the minimum threshold than a fair process of elimination is established until a candidate passes the threshold and wins the seat. Lastly, DMP, this was first established in Alberta, however, they have not held an election on this system yet. In layman’s terms, party may run more than two candidates in each riding, and voters will elect a primary and a secondary candidate. If province wide if a party wins fifty percent of the votes, but only 40 percent of the seats. The secondary candidates for that party will make up the balance. Thus, providing proportional representation based on the percentage of the popular vote it has won during an election. This is simply a summarized version we encourage our readers to get as much information as possible to see which system they feel could serve their needs the best. We encourage all our readers to vote on this important referendum that could facilitate fair representation for our community, other minority groups who are not represented at government levels, and of course strengthen our democracy. There are number of countries that have adapted the proportional representation system, such as Australia, Germany, Ireland, Malta, New Zealand, Scotland, and it has proven to be in providing better representation for the people. 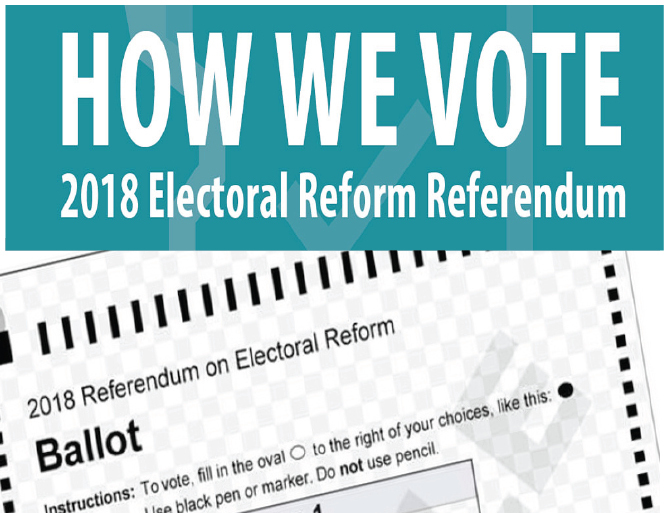 Once again, we encourage all our readers to obtain their package from Election BC and return their referendum ballot before November 30th, 2018.